Mattereum wants to tokenize the real world. If I ordered a Rembrandt, would you want some? That’s the idea behind blockchain startup Mattereum, which wants to tokenize purchases and investments so that ordinary people can buy tiny shares of real estate, art, or almost any other goods. 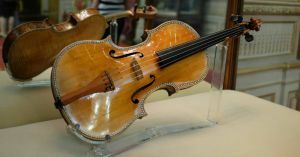 TechCrunch reports that in a flashy bid to showcase the concept, the company has purchased a $9 million Stradivarius violin that it has already opened up to investments on its platform. A blockchain is a distributed network in which all members’ computers are used to independently verify transactions or other activity, preventing any one party from having too much power and hopefully improving security. The core idea holds promise, but the industry has courted hype and scams that have made it hard for the public to get a good grasp on what it is and how it works. To tokenize something basically means to buy and sell shares of that object, usually via the cryptocurrencies that people generate and trade on blockchain networks. But Mattereum wants to be the platform people use to bring blockchain transactions and marketplaces to the real, physical world. For instance, people who invest in that part of that violin would be able to stipulate rules, TechCrunch reported, such as requiring a certain number of performances per year in that investor’s country. Mattereum isn’t the first to try to tokenize the entire economy. The big challenge — at which most blockchain startups have failed — is to convince people that decentralizing actually provides an advantage. Last year, Recode reported that 23 to 28 percent of Americans don’t have reliable internet service in their homes — and that’s still way better than most other countries. That’s to say there are bigger fish to fry before we can put everything on a digital blockchain and declare the economy revolutionized.